CHICAGO , IL. There were a lot of reasons to be thankful last Saturday afternoon at the Holgren Sports Complex. The Force got back on the winning side upping their record to 3-2. They put together four quarters of solid football enroute to a 33-0 victory over the Iowa Crush. Chicago dedicated the game to the National Cancer Awareness Foundation. Kristi Parker, a cancer survivor and mother of Force player, Kara McCafferty, performed the pre-game coin toss and received a standing ovation from the crowd. Rookie QB Sami Grisafe and second year QB Angie Bandstra, highlighted the offensive attack, and both proved to be invaluable. At 9:24 of the opening quarter, Grisafe scored on a 12-yard keeper that was set up by a strong 22-yard run by steady RB Esther Henigan. 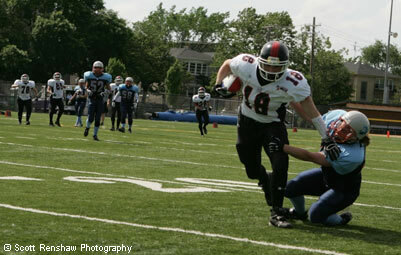 The extra point was made by Tricia Charbonneau. With three minutes to go in the first quarter, Jennifer Dulski, who seemed to be present on virtually every tackle, recovered a Crush fumbled punt giving the Force great field position deep inside Iowa territory. Grisafe once again helped the cause with a 24-yard pass completion to Bridget Fahrner to the seven. One play later, Grisafe bulldozed her way over the goal line to make it 13-0. Bandstra, playing at wide receiver for the first time, caught a tight spiraled pass from Grisafe for 15 yards, and turned it into an impressive 39-yard touchdown, with six minutes left until halftime. On Chicago 's first possession of the second half, Bandstra, now at quarterback, made a move to the outside and scampered 42 yards for the score. With the fans on their feet, the Lakeside Pride Band playing, and the Chicago Spirit doing push-ups to celebrate the touchdown, Bandstra found RB Sally Beaumont in the corner of the end zone for the two-point conversion. The Force closed out the scoring barrage with 1:48 to play, when WR Linda Bache made a diving grab from Bandstra. All told, Bandstra, who was named game day MVP, caught, passed, and ran for three scores. "Angie got out of the shoot early and showed a lot of maturity today," said Head Coach Jim Stahl. "It was very exciting to be on the other end of the pass today," explained Bandstra. "As a quarterback I know the route. This game was special." The Force defense didn't allow a single first down the entire first half. Defensive game day MVP, Becky Thuestad recorded six tackles on the day. "I know that I'm looked upon to lead," said Thuestad. "I'm not a real loud person. I like to set an example with my play on every down."